4/19: Jimmy Dunn at The WooHaHa Comedy Club, 50 Franklin St.
Mike McCarthy at The Comedy Attic, 257 Park Ave. The Rowdy Show at The WooHaHa Comedy Club, 50 Franklin St. Soul Mic Players Club Comedy Jam at Noamesco, 43 Pleasant St.
4/20: The Sort of Late Show with Shaun Connolly at Nick’s, 124 Millbury St.
Jimmy Dunn at The WooHaHa Comedy Club, 50 Franklin St.
4/22: WOOtenanny Presents! at Nick’s 124 Millbury St.
4/23: Open Mic at Electric Haze, 26 Millbury St.
4/24: The Dime at Beatnik’s, 433 Park Ave.
Open Mic at The Compass Tavern, 90 Harding St.
4/25: Funniest College Kid in the City at The WooHaHa Comedy Club, 50 Franklin St.
4/26: Total Loss, a one man show by Will Martin at Nick’s 124 Millbury St.
4/27: Amy Tee at The Comedy Attic at The Comedy Attic, 257 Park Ave.
DTFO Presents at The Summit Lounge, 116 Water St.
4/28: Open Mic at The WooHaHa Comedy Club, 50 Franklin St.
4/29: WOOtenanny Presents! 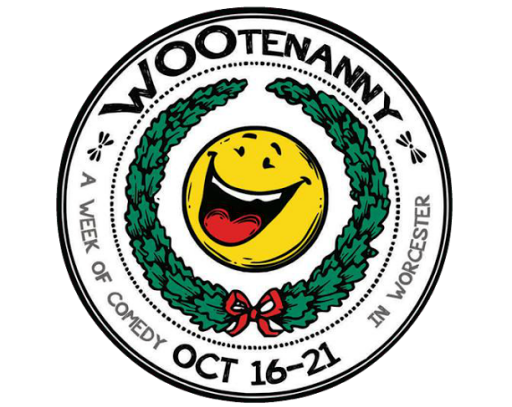 Shaun Should Quit Now at Nick’s, 124 Millbury St.
4/30: Open Mic at Bull Mansion, 55 Pearl St.
5/1: Wednesday Night Mayhem at Beatnik’s, 433 Park Ave.
5/2: Worcester Welcome Wagon at The WooHaHa Comedy Club, 50 Franklin St.
Open Mic at The Comedy Attic, 257 Park Ave.
5/3: Federation of Belligerent Writers at Ralph’s, 148 Grove St.
Tony V at The WooHaHa Comedy Club, 50 Franklin St.
Dan Crohn at The Comedy Attic, 257 Park Ave.
5/4: Tony V at The WooHaHa Comedy Club, 50 Franklin St.
Al Park at The Comedy Attic, 257 Park Ave.
5/5: Open Mic at The WooHaHa Comedy Club, 50 Franklin St.
5/6: Open Mic at Nick’s Bar, 124 Millbury St.
5/7: Get the Riff Out at Beatnik’s, 433 Park Ave.
5/8: Open Mic at Beatnik’s, 433 Park Ave.
5/9: Hot Dog! A Stand Up Sideshow at Coney Island Hot Dogs, 158 Southbridge St.
Alingon Mitra at The WooHaHa Comedy Club, 50 Franklin St.
5/10: Alingon Mitra at The WooHaHa Comedy Club, 50 Franklin St.
Frank Santorelli at The Comedy Attic, 257 Park Ave.
5/11: The Sort of Late Show with Shaun Connolly at Nick’s 124 Millbury St.
5/12: Open Mic at The WooHaHa Comedy Club, 50 Franklin St.
5/13: Open Mic at Vincent’s, 49 Suffolk St.
5/15: Wednesday Night Mayhem at Beatnik’s, 433 Park Ave.
5/16: Rich Vos at The WooHaHa Comedy Club, 50 Franklin St.
5/17: Rich Vos at The WooHaHa Comedy Club, 50 Franklin St.
Sean Sullivan at The Comedy Attic, 257 Park Ave.
5/18: Rich Vos at The WooHaHa Comedy Club, 257 Park Ave.
5/19: Open Mic at The WooHaHa Comedy Club, 50 Franklin St.
5/20: Open Mic at Nick’s, 124 Millbury St.
5/21: Roast Battle at Beatnik’s, 433 Park Ave.
Open Mic at Electric Haze, 26 Millbury St.
5/24: Erica Rhodes at The WooHaHa Comedy Club, 50 Franklin St.
Danny Kelly at The Comedy Attic, 257 Park Ave.
5/25: DTFO Presents at The Summit Lounge, 116 Water St.
Erica Rhodes at The WooHaHa Comedy Club, 50 Franklin St.
5/26: Open Mic at The WooHaHa Comedy Club, 50 Franklin St.
5/27: WOOtenanny Presents! at Nick’s Bar, 124 Millbury St.
5/28: Open Mic at Bull Mansion, 55 Pearl St.
5/29: The Dime at Beatnik’s, 433 Park Ave.
5/30: Open Mic at The Comedy Attic, 257 Park Ave.
5/31: Oh God No, A Sketch Group at Nick’s Bar, 124 Millbury St.
Christine Hurley at The WooHaHa Comedy Club, 50 Franklin St.
Drew Dunn at The Comedy Attic, 257 Park Ave.
A very very fun Sort of Late Show! Thank you to Beyond Wrestling and Drew Cordeiro, Sticki Pictures, Liam McGurk and Robin Courtney! See you on Monday for the Open Mic of Doom! SATURDAY! Beyond Wrestling’s founder Drew Cordeiro plus so much more! 7PM and it’s just $5!! We are so excited for the Sort of Late Show on Saturday. Next week is this amaze balls show with Will Martin. Tix link in bio! !